If you like a light and healthy cuisine and yet very easy to prepare, well papillotes are for you. This cooking technique can accommodate any ingredient, fish, meat, fruits, vegetables, etc… and papillotes can be prepared in advance and are cooked at the last minute, so you don’t have to spend hours in the kitchen when the guest are having fun. Even though easy to prepare, there are some basic rules that need to be followed when preparing a papillote, such as cutting finely and regularly the fruits or vegetables to reduce cooking time and keep the flavors. Also marinating some fishes, seafood, or poultry to enhance the dish. Aren’t those a delightful way to serve your side dish when you have guests? It’s like a little present on your plate, you open it like a candy et voilà, surprise! You can play with the folding of the papillote, as a rectangle, triangle, as a candy shape, or even heart shape and be creative with it. Today I found those gorgeous and fresh baby artichokes at my favorite market, and I gave them a provençal makover. You need small creamer potatoes that will remain firm when cooked and you get a delicious dish avec un petit air de Provence. These papillotes would be perfect served with a white fish or poultry. I ate mine as a main meal and it was perfect. While in France I searched all the new products such as salts, peppers, etc…I found this amazing salt and I fall madly in love with it. 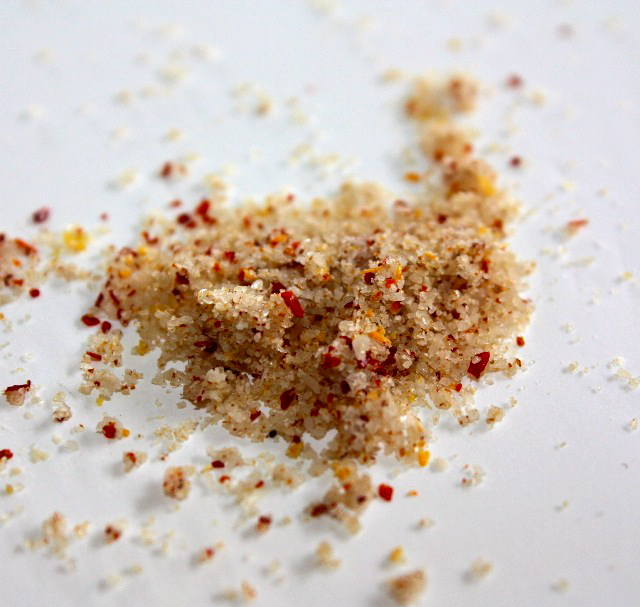 It’s a sel gris de Guérande (Grey Guérande salt) with Piment d’Espelette (a fragrant Basque pepper), I love it so much that I just add it in any dish. 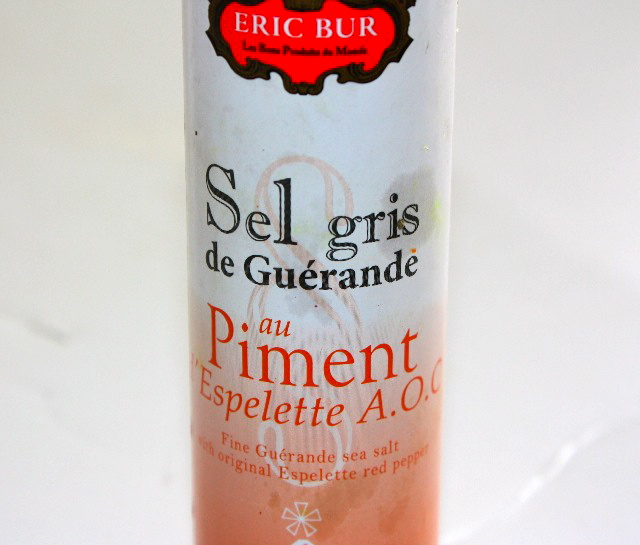 You could make this yourself, if you buy Piment d’Espelette and Sel gris de Guérande, then mix them together and keep them in an air-tight container for a while to get the salt infused. You can add sun dried tomatoes and onions to give a little more character to the dish. 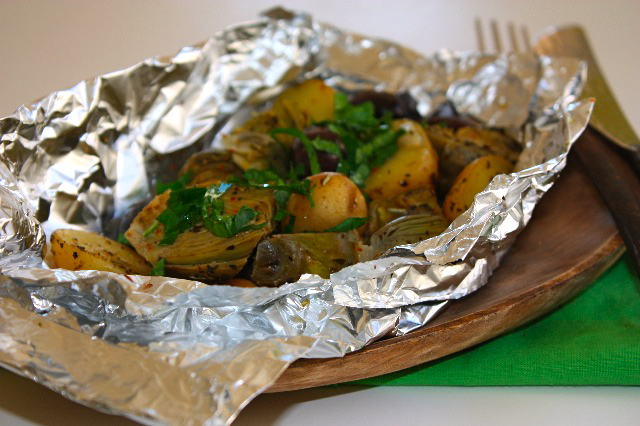 Also, both aluminum foil or parchment paper can be used, so have fun with your papillotes! Heat olive oil in a pan, add garlic and stir for a few seconds, then add artichokes and potatoes. Coat the vegetables with the olive oil, then add wine. Decrease heat and cover with lid. Cook for about 5 minutes. In a mixing container, add vegetables to herbes de Provence, olives, sun dried tomatoes (if using them), Piment d’Espelette salt and pepper. Mix well. 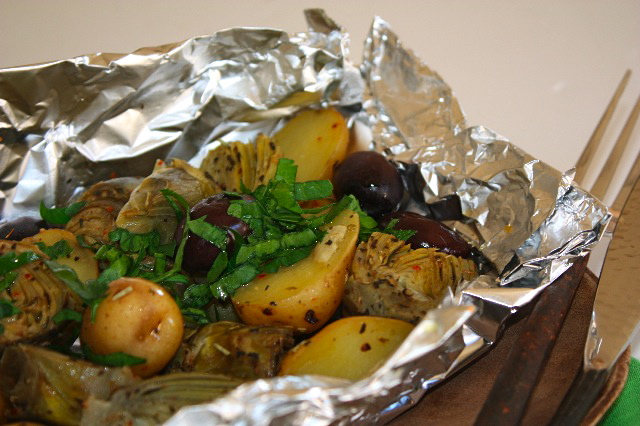 In a aluminum foil, add a little olive oil, place vegetables on top and close papillote very tightly so no air can get through it. Cook in a pre-heated oven at 370F for about 15 minutes. remove from the oven and serve. This entry was posted by silvia on March 8, 2011 at 5:21 am, and is filed under Vegan, Vegetables. Follow any responses to this post through RSS 2.0.You can leave a response or trackback from your own site. Silvia, I like cooking this way too. Just turn on the alarm clock will do. It really makes things easier. Thanks for sharing. Have a lovely day, dear. p/s hope you’ll have a safe trip! Just exquisite flavors! I love this dish! This would be a meal in itself for me. Just add a lovely salad and I’m there. Wow, this is right up my alley, as they say. Simple goodness, beautiful presentation and, I’m sure, exquisite flavor. This looks great. Artichokes are on special right now and what a great way to fix them! I’ll have to try this. You’re right, papillotes are like a fun little present at the table! I love it. And I don’t know if you know this about me, but I am a total salt junkie. I am coveting that awesome salt, I will have to make my own. I haven’t visited you for a while, Silvia but I’m sure glad I came today. These wonderful papillotes are stuffed with flavor! What a lovely dish, dear! I love cooking with artichokes. Will try soon! I started cooking this way a few years ago…so good, and such a lovely presentation. I wish I could track down some of those artichokes! Thanks for sharing, sweet friend! I hope you are having a splendid Saturday night. Take time to relax and rejuvenate tomorrow. Hugs from Austin! Lovely flavours and beautiful photo of the salt! I agree about cooking things en papillote – I’ve been doing fish that way a lot recently (although haven’t blogged it, hmm…) and yes, a white fish would go perfectly with these veggies. Silvia, you can’t believe it, but I’ve just had this for lunch today (using purple Vitellote potatoes), then I come here and I find the same recipe!! !